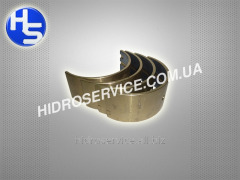 Ltd. Hydro-M can supply N251-2-2 inserts N251-2-3, N251-2-4, N251-2-5, N265-2-3 for reciprocating compressors. all repair sizes (nominal, first and second repair sizes) insert - a replaceable element sliding bearings connecting rod and piston reciprocating compressors. Unbelievable price on Bushes for piston compressors in Melitopol (Ukraine) company Gidroservis-M, OOO. Wide choice of quality products at affordable prices.